While Tom Stalba is constantly on the go with business and personal events, he just came off of a three week stretch that some would say was insane! The NHRA Lucas Oil Series made its second stop at Maple Grove Raceway on Memorial Day Weekend. Tom has many event wins at that track, and looks forward to going every year. Although racing 2 cars at one event can be a handful, Tom had the added challenge of running between Reading, PA and West Chester, PA, where his son, Paul, and team had a 3 day Ice Hockey Tournament. Tom is an assistant coach and wanted to be at the tournament as much as possible, although he did have to miss a game Saturday and Sunday. Thankfully, a great fellow hockey family kept Paul overnight so that Tom could get back to the track. After suffering a rare first round red-light in his 1963 Corvette Roadster in Super Gas, Tom rebounded to make it to the semi-finals in his Super Comp Dragster. Once he lost, he and wife, Karen, headed back to West Chester to catch the Championship Gam e of the Philly Shootout, which Paul’s team won in an exciting game. Once again, Paul brings home the hardware when his parents couldn’t get the job done! The following weekend it was off to New England Dragway in Epping, NH for Tom. With the help of fellow Super Gas racer Charlie Yannetti, Tom made it through the rain-delayed event to reach the finals on Monday and win in Super Gas. That trophy brought Tom’s National Event Win total to 9. After just 2 days home, Tom made the short trip from South Jersey to Englishtown for the third race weekend in a row. Tom made it late rounds in both cars, losing in Super Gas to Dan Northrop in the 3rd Round, and then losing to Heather Fetch in the Semi-Final round of Super Comp. Tom was a little tardy on the tree in Super Comp and Heather was on her game. Tom has a welcome break from racing this coming weekend, although the gang won’t be idle. Son, Paul, has an Ice Hockey Tournament at our home rink so the busy weekends continue. Next up for Tom is Norwalk, OH for the Summit Racing Nationals, followed immediately by the third stop on the Lucas Oil Series tour in Lebanon Valley, NY. Don’t think there is any slowing down in the near future! Thanks to Tom’s sponsors and supporters, including Lucas Oil Products, Hoosier, Brodix, K&N Filters, Autometer, VP Racing Fuels, A.A. Auto Salvage, Inc and Sunset Performance Engines. 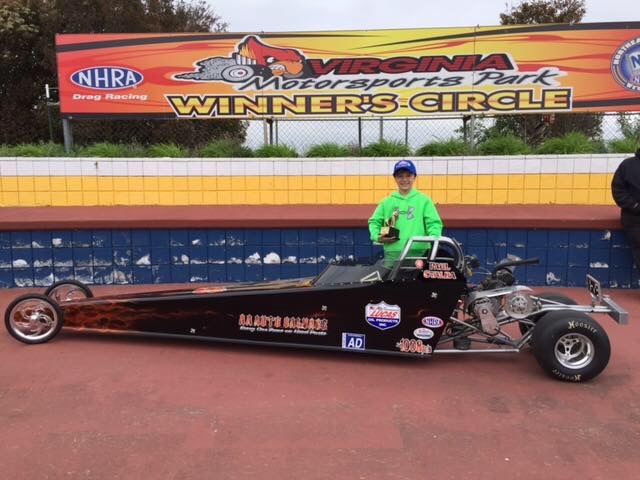 Tom Stalba gave it a big effort to try and join son, Paul, in the winner’s circle at the Division 1 NHRA Northeast Opener at Virginia Motorsports Park. Paul won the Junior Dragster Wally in the 6-9 year old class earlier Saturday afternoon, and Tom was able to reach the final in Super Gas, losing to Steve Furr, who also scored the win in Top Dragster. Tom lost earlier in the day in first round in his Super Comp dragster. Wife, Karen, lost in the opening round of Top Alcohol Dragster after smoking the tires. After what started out to be a rough weekend, with heavy rain storms on the drive from New Jersey to Virginia, last minute repairs to the motor home generator, and the accelerated race schedule due to impending Sunday rain, the Stalba Motorsports team had a very successful weekend. Once again, Paul was able to pick up a Divisional Wally (Paul won a Wally in Jr Dragster in Epping Divisional in 2015) and his parents were not able to finish ! Tom would like to thank Roy and Faron at Hoosier Racing Tire, VP Race Fuels, Lucas Oil Products , K&N Filters and the group at A.A. Auto Salvage, Inc for the support and encouragement. Paul would like to thank Hoosier, Ray Fordyce, Half Scale Dragsters and his family for helping him start his Junior Drag Racing career with early success. In addition to the racing activities, Tom and A.A. Auto Salvage, Inc. are pleased to continue the A.A. Auto Salvage King/Queen of dot-90 program. See the link below for details and make sure you get your decals at the next event! Congratulations to this year’s Queen of the .90, Michele Costa for her run in Super Comp. Don’t forget to check out www.aaautosalvagenj.com for your used car part needs. Next up for Tom and Karen is the Division 1 Points meet in Maple Grove, Pennsylvania on Memorial Day weekend. Follow us on Facebook at Stalba Motorsports for more information.